We feel, together it is our responsibility to make our country a better place to live. With this in mind, Rittal associated with ‘Surya Raitha’ to upscale the lives of millions of farmers in Modern India. 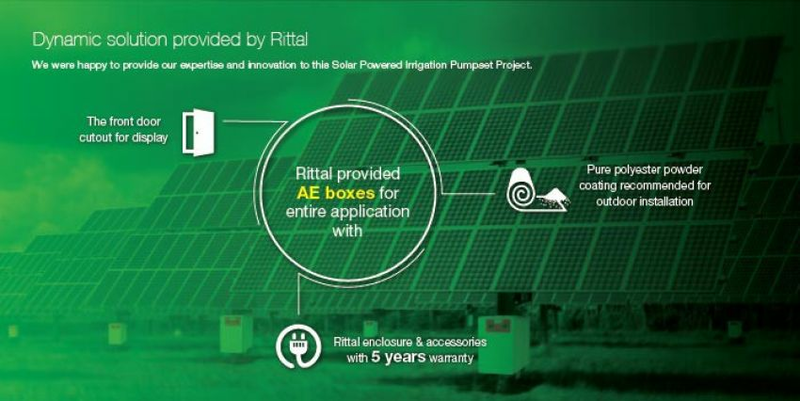 Rittal India collaborated along with 3SPS supplied AE boxes to Enarka in the pilot project of ‘Surya Raitha’, a Solar Powered Irrigation Pumpset Project in Harobele, Karnataka. This ambitious initiative by the Government of Karnataka is expected to reduce the burden of both the Government and Farmers. It will also re-establish the value and importance of Green Energy. An electrical enclosure is a cabinet for electrical or electronic equipment to mount switches, knobs and displays and to prevent electrical shock to equipment users and protect the contents from the environment. The enclosure is the only part of the equipment which is seen by users; in many cases it is designed not only for its utilitarian requirements, but also to be pleasing to the eye. Regulations may dictate the features and performance of enclosures for electrical equipment in hazardous areas, such as petrochemical plants or coal mines. Electronic packaging may place many demands on an enclosure for heat dissipation, radio frequency interference and discharge protection, as well as functional, aesthetical and commercial constraints. Hence we choose Rittal Product. With an objective of responsibly contributing to the welfare of our environment and society, Rittal India undertook the supply of enclosures for ‘Surya Raitha’. This first-of-its-kind Solar Powered Irrigation Pumpset Project will be beneficial to both the government and farmers alike, as it will look to increase the consumption of Green Energy in Karnataka. The entire project is financed by Farmer investment, Government subsidy to Irrigation Pumpset, and investment from BESCOM as interest-free loans. Under this project farmers can use solar powered energy for irrigation purposes and sell excess energy to BESCOM grid, thus providing them with an alternate source of financial income for the amount of electricity transferred. Rittal being India’s leading and finest solutions provider for power distribution and service, brought in its innovative technologies to breakthrough this project. Rittal co-operated with Enarka instruments Pvt Ltd, one of the leading supplier and manufacturer off Grid Solar Inverter, Stand Alone Solar Inverter, Grid Tied Solar Inverter, Solar Pump Controller, Programmable Dc Power Supplies, DC Power Supplies and many more. We provided AE boxes with all the specifications for outdoor installations to Enarka. Our boxes facilitate special bracket arrangements for internal mounting under which the meters are mounted. These meters shows the amount of electricity generated and how much is consumed by the farmers. Based on these readings and the amount of electricity transferred to BESCOM, the government will pay the farmers on half yearly basis. These Irrigation Pumpset will not only pump 1.5 times more water than the normal Irrigation Pumpset but will also supply 1/3rd of total energy generated to the nearby electricity grid. This will be a one-time solution for the farmers not only for their irrigation requirements but also for generating alternate source of income from these pumps. Established in 1961, Rittal is World's Leading Systems provider for enclosures, power distribution, climate control, IT infrastructure and software & services. Rittal provides you with solutions that are custom-made to your definite needs and requirements – completely individual, tailored to your company and industry, directly from our standard product range. We are known in high regards for our versatile and flexible range of products and services, as they perfectly compliment the exhaustive product portfolio that we put up. Our team of service partners and trained service engineers help us to provide innovative maintenance services in Rapid Response time. Ensuring impressive and dependable systems in full availability with all application areas worldwide, 24/7, 365 days a year.